Last week was rather quiet with not much of economic releases. However, the speeches from Donald Trump and Janet Yellen stood out on lack of any credible economic releases. The markets were a bit disappointed as the President-Elect failed to mention anything about the proposed fiscal spending plans. This met with a modest tempering of expectations, but the markets still remain hopeful that further details will follow. The Federal Reserve Chair, Janet Yellen delivered a speech at at Town hall meeting in Washington D.C. last week speaking to a group of economic teachers. Ms. Yellen did not make any major references to monetary policy but expressed confidence in the growth of the U.S. economy in the short term. The Fed has signaled three rate hikes in 2017 and so far last week many of the Fed members who spoke have maintained this view. The next FOMC meeting is in February but it is unlikely to expect a rate hike. Following the February meeting, the next major FOMC meeting with a press conference is due in March, which is when the next rate hike could come. In other news elsewhere, the ECB released the meeting minutes from the December event. The central bank had agreed to extend its bond purchases to end of 2017 but at a smaller pace of 60 billion euro compared to the current 80 billion starting March 2017. The meeting minutes showed that some members of the ECB’s governing council were of the opinion that the central bank’s bond purchases were not required and welcomed the tapering, but expected further cuts to QE. In the UK, the British Prime Minister’s weekened comments that UK will be looking at a hard Brexit sent the British pound weaker and brought back the Brexit voltility. The British pound has remained weak since then. 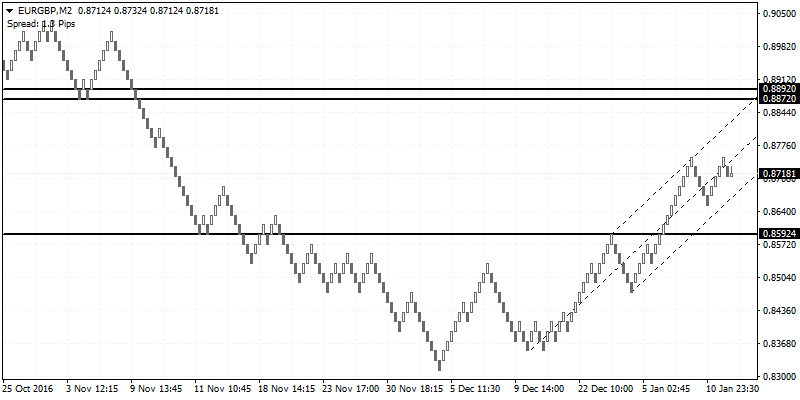 EURUSD has been trending higher ever since price hit the lows above 1.0471. 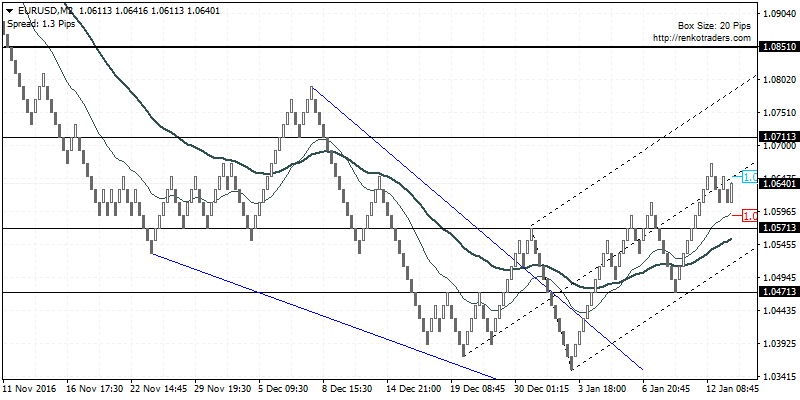 The continuation to the upside is expected to see price potentially reach the first resistance at 1.0711. There is scope for EURUSD to retest the support level at 1.0571 following which, we can expect to see further gains likely to be posted to the upside towards 1.0851. Alternately, if EURUSD slips below 1.0571, then expect a correction towards 1.0471 once again. 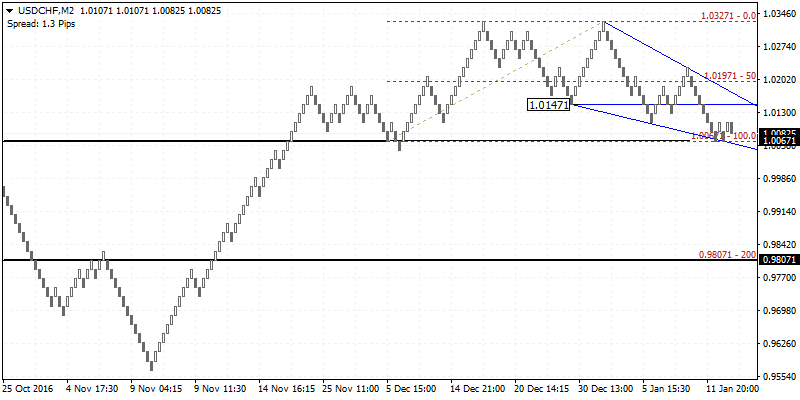 The bullish bias remains intact as long as price doesn’t close below 1.0471. USDCHF has been trending lower ever since price formed a double top pattern near 1.0327. The resulting decline to 1.0067 has formed in support level being established here. There is also the potential of a head and shoulders pattern that could be taking shape. However, for this to be validated, USDCHF will need to bounce back higher off the support level at 1.0067, potentially towards 1.0197 – 1.01471 as price action is showing consolidation within the descending wedge pattern. Looking for a reversal near 1.0197 – 1.0147 could signal a push to the downside, initially targeting 1.0067 followed by a larger decliner towards 0.98071. The rally in gold prices last week, towards 1200.00 shows a completion of the bullish flag pattern that was formed few weeks ago. The main support level now sits at 1161.60 and above this level comes a minor support level at 1171.60. The price action at the current levels shows gold prices losing momentum and a potential descending triangle forming. If the support at 1190.59 breaks, expect gold prices to slide towards 1176.60 as the minimum target. 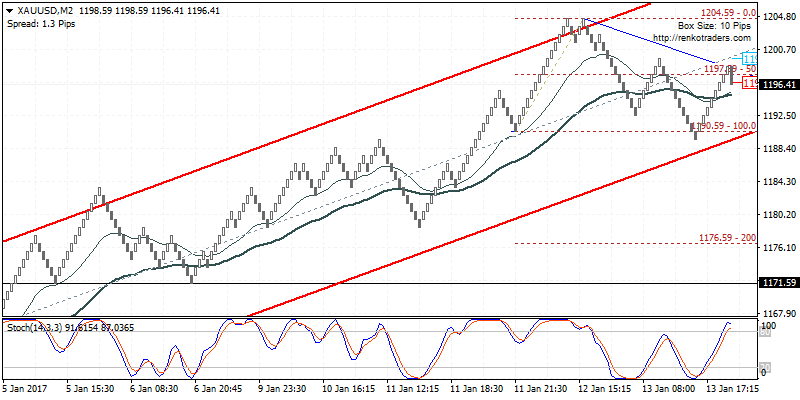 The bearish bias will be invalidated only on a strong breakout above 1200.00. EURGBP is likely to see further upside as the British pounds remains weak. The current rally will be looking to targeting 0.8892 – 0.8872 resistance level to the upside. However, there is potential for EURGBP to slide to the downside to establish support at 0.8582 which previously served as resistance level. A retest of support here could confirm the upside bias. This bullish scenario could however weaken in the event that EURGBP slips below 0.8592 and posts a close below the local swing pivot level of 0.8472. The week ahead will see some important economic releases with most of the action concentrated around the UK. Firstly, the British PM Theresa May has scheduled a press conference on Tuesday where she is expected to lay out her vision of Brexit. Bear in mind that the UK’s Supreme Court is yet to give its ruling on whether Brexit requires a parliamentary approval or not. Besides the Brexit press conference, monthly inflation figures are expected on Tuesday and headline consumer prices are expected to rise steadily in December. Later in the week, the monthly jobs report is forecast to show an increase in the average earnings index while the UK’s unemployment rate is expected to remain unchanged at 4.8%. The week winds up with Friday’s retail sales report. In the U.S. the Fed Chair Janet Yellen will continue with her speech on Wednesday and Thursday. On the economic front, the U.S. December inflation figures will be coming out and expectations are strong that inflation will shoot above the 2% inflation target set by the Fed. This could be a big win for the central bank. Monday is a holiday in the U.S. so it would be a short trading week.